FIXOR MP™ DEMOLITION CHARGE (500 ML) is comprised of one deployable plastic bottle containing FIXOR MP™ Part A (Class 3 flammable liquid) and another bottle that contains FIXOR MP™ Part B (Class 8 corrosive liquid). When the Part B is added to the bottle of Part A, 0.564 kg (1.24 lb.) 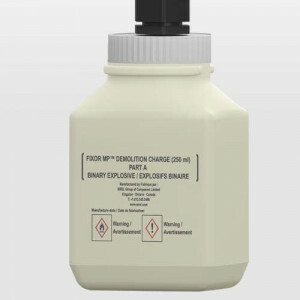 of FIXOR MP™ Binary Explosive (Class 1.1D explosive, UN0048) is instantly formed inside the deployable bottle. A fully adjustable Detonator Adapter is provided to securely hold a detonator in place (detonator not included). 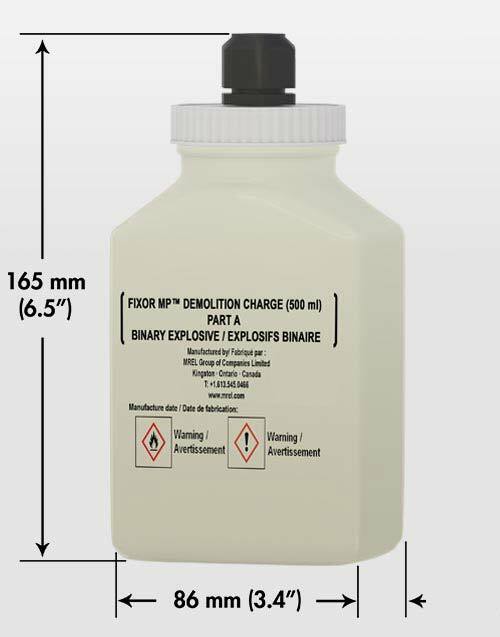 FIXOR MP™ DEMOLITION CHARGE (500 ML) has been proven effective at destroying a large variety of anti-personnel and anti-tank mines as well as Unexploded Ordnance (UXO) including difficult targets such as thick walled mortar and artillery shells. 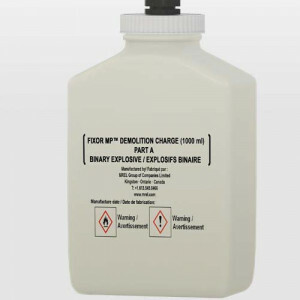 FIXOR MP™ Binary Explosive is also the driving explosive used in all of MREL’s EZCore II™ Tactical Disrupters to defeat Improvised Explosive Devices (IEDs). 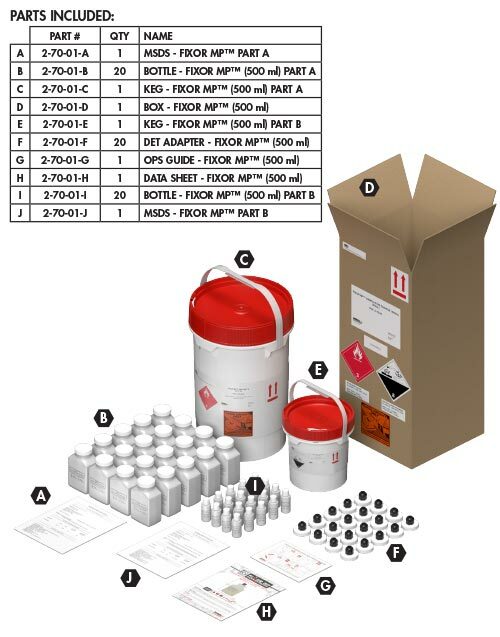 Non-explosive for transport and storage. Flexible shipping worldwide by FedEx, air cargo, truck freight and ocean freight. Becomes a safe, reliable, high brisance explosive instantly when needed and mixed. Fully deployable packaging that is ready for detonator insertion.